This great little restaurant in Beomo serves a regional speciality, 돼지국밥 (Dwaeji gukbap), which is a pork soup served with rice. This is a great, cheap, meal (which is okay to eat by yourself). 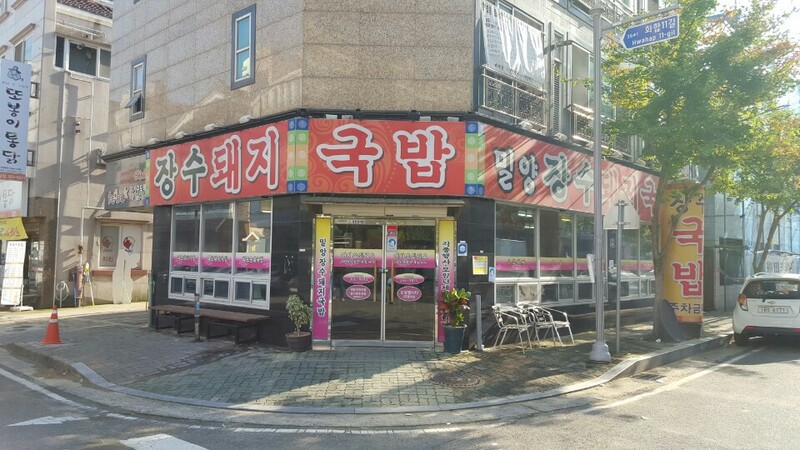 The restaurant is open 24 hours and also serves 순대국 (Sundaeguk) which is similar but with blood sausage instead of sliced pork in it. For more information about 돼지국밥 check out http://blog.korea.net/?p=17410. Directions: This restaurant is located in 범어 (Beomo), which is a 15-20 minute walk over the bridge from Yangsan E-Mart. A taxi costs around ₩3000, just say to the driver, “Beomo Dunkin Donut-uh.” Walk straight down the road to the right of Dunkin Donuts, you should pass several pizza take aways and an hairdressers. Take the next street on your left, you’ll see a 7/11 convenience store across the street, the restaurant is opposite the 7/11.